Product 6 Gauge Set Style Pulsar Series Green Unit Of Measure Imperial Speedometer Gauge Included Tachometer Gauge Included Fuel Level Gauge Included Oil Pressure Gauge Included Volt Gauge Included Water Temp Gauge Included Trim Ring Series Modern Trim Ring Color Black Needle Series Modern Needle Color Black Emblem None Assembly Gauge with Face Installed Speedometer Range 0 - 120 mph Tachometer Range 0 - 10,000 rpm Fuel Level Range Empty - Full Oil Pressure Range 0 - 100 psi Volt Range 8 - 16 volt Water Temp Range 100 - 250 f Interchangeable Faces Yes Interchangeable Needles Yes Interchangeable Trim Ring Yes Number of Gauges 6 Number of Large Gauges 2 Number of. With over 75,000 square feet of OEM Style parts, restoration, suspension components and aftermarket accessories for your ride under one roof we got you covered. If it is stock, custom, old or new we got the parts for your ride! Custom Supply Warehouse has been owned and operated by the same family for over 50 years and we are proud to share our philosophy of offering large amounts of quality auto parts and accessories to select from at the best prices available PERIOD! In addition we offer expert technical advice along with our world famous customer service. If your looking for OEM, hot rod, restoration, or aftermarket parts for any type of vehicle, you will find it here! 6 Gauge Set Speedo Tacho Oil Temp Fuel Volt Pulsar Green Black LED 043-WC SAE LS. Product 6 Gauge Set Style Pulsar Series Green Unit Of Measure Imperial Speedometer Gauge Included Tachometer Gauge Included Fuel Level Gauge Included Oil Pressure Gauge Included Volt Gauge Included Water Temp Gauge Included Trim Ring Series Modern Trim Ring Color Black Needle Series Modern Needle Color Black Emblem None Assembly Gauge with Face Installed Speedometer Range 0 - 120 mph Tachometer Range 0 - 10,000 rpm Fuel Level Range Empty - Full Oil Pressure Range 0 - 100 psi Volt Range 8 - 16 volt Water Temp Range 100 - 250 f Interchangeable Faces Yes Interchangeable Needles Yes Interchangeable Trim Ring Yes Number of Gauges 6 Number of Large Gauges 2 Number of Small Gauges 4 Large Gauge ID 2.25'' 56.8mm Small Gauge ID 1.8'' 47mm Large Gauge OD 3.37'' 85.7mm Small Gauge OD 2.06'' 56.4mm Speedo Sensor GM Fuel Sensor Included Programable Fuel Sensor Yes Pressure Sensor Included Temp Sensor Included Tachometer Cylinders Adjustable Up to 12 Stepper Motor Accurancy Industry Leading Accuracy Designed in the USA. Stock photos may not be an exact representation of the item. Please read all product info, descriptions and terms before purchasing. All of your items fit in one box. 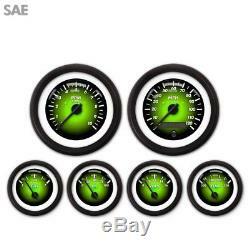 The item "6 Gauge Set Speedo Tacho Oil Temp Fuel Volt Pulsar Green Black LED 043-WC SAE LS" is in sale since Friday, October 13, 2017.